Ever since moving to The Hague I had the idea of cycling to my parents' house. The distance being over a 100 kilometers I had always assumed it would be a 2 day trip. Now that the new bicycles were pretty much complete we planned to do the trip in the Easter weekend, which was then canceled because my parents were not at home. We re-scheduled for Saturday 3 May 2014. The total distance of the trip was a little under 120 kilometers, with the weather looking good and a northern wind of around 4 Beaufort we decided to pull ahead and try to complete the whole trip in one day, and be at my parents house before dinner. In the summer months of July and August there are various ferry services in between the islands. However, since it was still May we had to ride across the various dams and bridges that have been built as part of he Delta Works in the last century. Video of 6:27 minutes long, taken during the trip, available in HD. The video while riding is taken with a GoPro Hero camera, mounted on the low rider above the front wheel, and hand held on an extendable stick. Since this would be a 3 day trip we had to pack clean underwear and socks. The distance we had to cover meant that we did not have time to shop for food, so we brought along a packed lunch and snacks for along the way. When we started the cycling season in February this year we could easily ride 60 kilometers and only drink half of a 800 mL bottle, however by the end of April it was a lot warmer and we ran out of water halfway through a shorter ride, and had to get a refill. It would have been easy to get a refill at any house, Mimi insisted on bringing another 2 liters. In total we brought 4.6 liters with us, which proved to be enough for the trip. Our new frame bags from Revelate Designs had just arrived the day before, this trip was an excellent opportunity to test them. The route we cycled from The Hague to Zeeland. We had planned to leave the house around 9, we woke up early and were considering of getting out even earlier. Eventually we closed the door around 9:15. The first big obstacle would be to cross the river mouth of the Meuse (Maas). Initially we thought to go along the coast through the dunes to Hook of Holland, and cross the river with the fast ferry there. Cycling along the coast is easy, and something we have done several times before. The problem was that this route is slightly longer, and the fast ferry only goes every hour. Instead we opted to go straight down through the Westland towards Maassluis. This route is slightly shorter, and the ferry there goes every 20 minutes. Getting to Maassluis took a little over an hour, as we zigzagged through the Westland we had to take various stops for pictures of the houses. In order to get to the ferry we had to go along the old harbor, which is surprisingly charming. Maassluis by itself definitely seems worth a visit. The ferry continuously goes across, it was possible to pay for a ticket with a debit card on a machine, and with cash on the boat. The information regarding bicycles was rather confusing, as it lists the prices for the bicycle, which in the most literal sense means that the rider has to pay separately, but this turned out to be not the case. After returning I sent a complaint, and over a month later received a letter that they would improve the information about taking bicycles on the ferry. 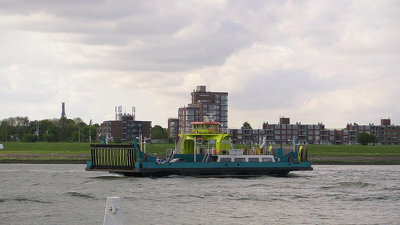 The ferry with Rozenburg in the background. The ferry dropped us of in Rozenburg, which is on the island Voorne-Putten. From there we headed toward the town of Brielle. Soon we came across a confusing sign, indicating the town was 4 kilometers straight ahead (red) and 3 kilometers left (green), while green indicated a scenic route which are generally longer. We decided to take the short yet scenic route, which was quite scenic indeed, but I doubt if it was in fact shorter. Along the scenic route we had a lunch break at a picknick table, and soon after that we reached the outskirts of Brielle. We made a quick stop when we came along an ATM, since we left the house with only a few coins. We did not go into the town, but headed toward Rockanje, which again we did not enter. Instead we crossed the 5 kilometer long Haringvlietdam, which lead us to the next island. As we were heading South West now the wind was not always helping us, which slowed us down somewhat. Goereep-Overflakkee is the most southern part of Holland, and the last one before crossing into Zeeland. Having lived most of my life in Zeeland, I cannot recall ever being here before, and was pleasantly surprised by its charm. I was getting uncomfortable on my saddle, and moved it back a bit, which was a big improvement. We were now following the North Sea cycle route (part of EuroVelo 12), which goes straight through the town of Goedereede, which is definitely worth a visit as well. Navigating across the island was slightly confusing. We headed toward the Brouwersdam, but part of the road was blocked which sent is through the town of Ouddorp. Soon after that the name Renesse started to appear on the signs, which we followed to get over the Brouwersdam. The North Sea cycling route crosses right to the center of Goedereede. 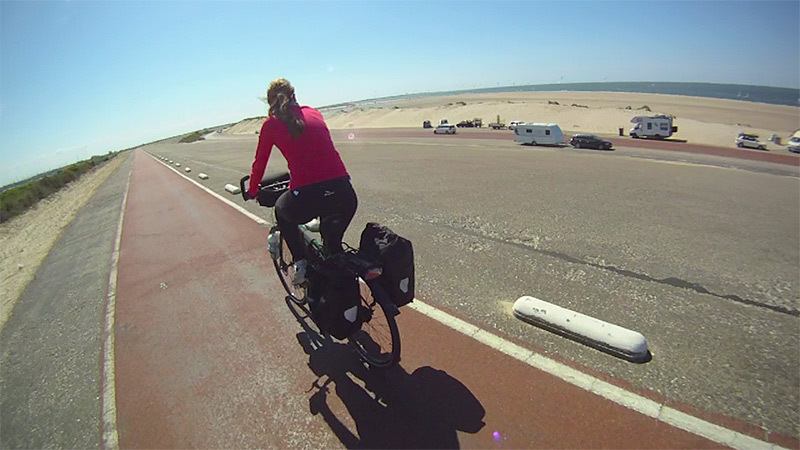 After crossing the Brouwersdam we left the North Sea cycling route again and instead of going towards Renesse, we headed left for Scharendijke from where we went straight across the island toward Zierikzee. Going South East we had the wind in our backs we were able to keep good pace. The interior of Schouwen-Duiveland is mostly farmland, without much else going on. Compared to the other islands it was very straightforward. 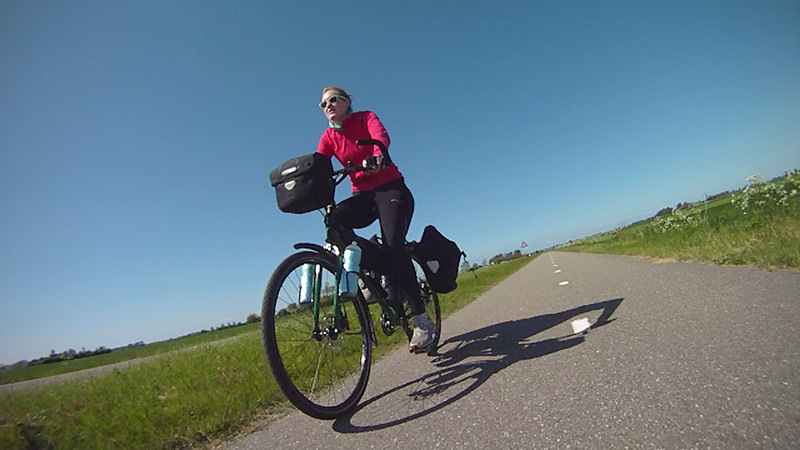 The cycling path to Zierikzee is nice, straight and flat. We reached the outskirts of Zierikzee around 16:00 hours in the afternoon. Since this was the last town on our way we decided to take a break here and have drink at a cafe, and make use of the restroom. Zierikzee is another charming town with a medieval feel to it. About an hour later we departed towards the Zeelandbrug, a 5 kilometer long bridge, with the wind in our backs we crossed it relatively easily. The sky was so clear that we could already see the television tower of Goes, which is another island over. There is not much going on on the island of Noord-Beveland, there was a good cycling road along the highway, we had a small stop for a snack and some water, and then crossed the Zandkreekdam. For the last part we had to head west again, which meant the wind was facing us again. I had planned our route so that we did not have to go against the wind for a long time, so we went west first to Wolphaartsdijk, headed toward Eindewege and then did the final kilometers against the wind. By this time we were both getting pretty tired, but around 18:46 hours we arrived at my parents house, in time for dinner. The whole trip took about 8 and half hours, during which we made several long stops. The bicycles performed excellent. When we had the wind from behind we were often cycling in the highest gear, the bicycles were remarkably stable with the luggage at high speed. The next day we were fairly knackered. We took another small bike ride, and my bum felt like I had been riding for 2 hours already. Mimi experienced pain in her knees, and had to slow down significantly. The pain subsided over the next days. It was quite interesting to do over 100 kilometers, its certainly doable, but repeating it next day is not something we would gladly do. 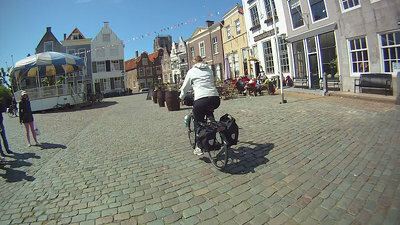 We used most of our water, and stopped for drinks in Zierikzee, which means we consumed at least 2 liters each. One year later, in June 2015 we cycled to Zeeland again. This time we cycled a slightly longer route. Taking a more direct route up to Goerree-Overflakkee, then the same route across the island and Brouwersdam. On Schouwen-Duiveland we went west, throygh Renesse and Burgh-Haamstede, over the Oosterdscheldedam, and through Veere. The wind was coming for the northeast, so we did not get as much support as the year before. Since it was later in the season we were better trained, and felt less sore the next day, but still were pretty tired.